Nosh Narrabri has received a welcome windfall for this year’s much-anticipated food and wine festival. This week, retiring member for Barwon Kevin Humphries presented Nosh committee members with a $20,000 cheque from the NSW Regional Flagship Events Fund. The fund will provide an annual grant of $20,000 of a triennial grant of $27,000 for marketing initiatives aimed at driving overnight visitation. “Hosting events helps shine a bright light on Narrabri Shire, while putting more heads on beds, diners in our restaurants and shoppers in our boutiques,” Mr Humphries said. “Nosh Narrabri is an iconic festival in the North West and continues to showcase great food and wine. It’s important that as government we partner with community to grow these events,” Mr Humphries said. Nosh Narrabri also received $16,500 in funding from Whitehaven Coal who have come on board as a major platinum sponsor for the event. Committee members were thrilled to accept the financial boost that will go a long way to helping to make 2019 the best Nosh event yet. “Nosh Narrabri showcases products by local growers, food creators and beverage makers: promoting sustainable food production, gathering the community together to celebrate the creativity and talent of others, and inspiring people to support local,” said Nosh President Darrell Tiemens. The event is being held on Saturday August 31 and Sunday September 1. Nosh returns, with flagship funding! Narrabri’s food and wine festival, Nosh Narrabri, is returning in 2019 and locals and travelers to NSW’s North-West are invited to attend. Showcasing the best in food, beverages and produce from across the region, Nosh is being held on Saturday 31 August and Sunday 1 September, with three big events over the two days. The main Nosh event, the Food and Wine Expo, will be held from midday on Saturday 31 August at the parklands behind the Crossing Theatre, on the banks of Narrabri Creek. Exhibitors will once again showcase food and beverages from across the region, and the creators who grow or make them. “Nosh Narrabri showcases products by local growers, food creators and beverage makers: promoting sustainable food production, gathering the community together to celebrate the creativity and talent of others, and inspiring people to support local,” says president Darrell Tiemens. Following the Expo, the ‘Nosh On’ Night will kick off in the evening, featuring entertainment and fireworks. The following day, the iconic Nosh Long Lunch will once again take place, with tickets to go on sale in the coming months. Nosh Narrabri is proudly supported by the NSW Government, as part of its Regional Flagship Events Program. The Program is managed by the State’s tourism and major events agency Destination NSW, and provides grants to events in regional NSW to support marketing activities aimed at driving overnight visitation and boosting local economies. “This is a major coup for Nosh and secures it as a pinnacle event on the regional tourism events calendar,” said Kevin Humphries, Member for Barwon, in Narrabri today where he announced the grant. “Events like Nosh play a cricital role for tourism in regional NSW. Nosh is a great community event, and its particularly important for the Narrabri community during times of drought. It provides an opportunity to us to get together to celebrate the local community, while showcasing our region and our products to visitors and providing a much-needed boost to local businesses and the economy. “We look forward to welcoming visitors to Narrabri for another very successful event,” Mr Humphries said. Above: Nosh committee members Michael Chappell and Brooke Southwell, Nosh Vice President Kate Logan, Member for Barwon Kevin Humphries, Nosh Vice President Ruth Redfern, and Narrabri Tourism Manager and Nosh committee member Penny Jobling. Nosh will be back this year, bigger and even better. Nosh Narrabri has gone from success to success since its inception in 2003. The 2019 Nosh is in the advanced planning stages now, set down for Saturday, August 31 and Sunday, September 1. “It is easily the biggest event of its kind in the region” said Nosh president Darrell Tiemens. “The last Nosh budget was $125,000. This year it will be just under $150,000. The Nosh will comprise the ‘main day’ and the following Long Lunch day. “During the Nosh day it will be a celebration of all things food and wine and the following day, Sunday, we will stage the famous Long Lunch” said Mr Tiemens. “This is always sold out. “Last Nosh we had 300 diners – this year we will have 350 seats available” he said. Above: Members of the Nosh Narrabri committee, were at The Crossing Theatre venue yesterday measuring the sites for marquees and stalls. From left, Joe Hayne of North West Marquees and Events, Nosh vice president Ruth Redfern, Penny Jobling, president Darrell Tiemens, Lindy McMicking, vice president Kate Logan, Georgie Stoltenberg, Amelia Hall, Hayden Baird of Narrabri Shire Council and Michael Chappell. David Pierce is turning a great idea into a brilliant project. Nosh Narrabri is a financial supporter of David Pierce’s community garden project and on Friday, Nosh Narrabri committee members Amy Withington and Ruth Redfern presented David with a donation towards the cost of establishing the garden. Nosh Narrabri distributes any surplus funds to community groups after each Nosh event. He had the ‘lightbulb moment’ of creating a community garden four years ago when he was enjoying the quiet while in his own garden on a Sunday morning. He then researched what he could do to initiate a community garden in Narrabri. David said he felt the need for local people to have a place to be themselves and learn more about plants and the local culture. He hopes for people to feel comfortable and happy to meditate, learn, and soak up the sun, all while feeling safe. “I am so grateful for all the generous donations towards this plan from community organisations including Nosh Narrabri, Abbeyfield, Filipino residents, Dementia Australia and others,” David said. “There will be a total of eight gardens and each business which made a donation will have its own garden to maintain for up to 12 months. The area for the garden is the ‘reservoir block’ adjacent to his house on the corner of Doyle and Balonne Streets. David believes this will be the perfect spot for the garden as it is close to town, the library, schools and disability housing. Pictured: Nosh Narrabri is a financial supporter of David Pierce’s community garden project and on Friday, Nosh Narrabri committee members Amy Withington and Ruth Redfern presented David with a donation towards the cost of establishing the garden. Nosh Narrabri distributes any surplus funds to community groups after each Nosh event. Thousands flock to town as Nosh Narrabri brings visitors from the region and interstate. 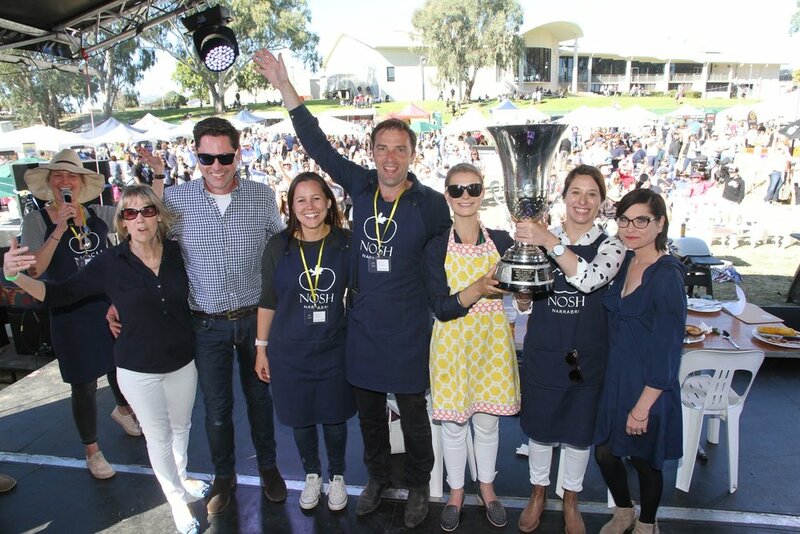 The weekend’s hugely successful Nosh Narrabri has again confirmed it as the premier North Western food and wine event and further consolidated Narrabri’s status as a dynamic regional community. The Nosh drew a record attendance. Thousands of people including many visitors from the wider region, southern NSW, the coast and Queensland joined shire residents to enjoy the event. The Nosh this year introduced a new format, new layout and new features. The gates opened at noon on Saturday and the afternoon’s activities moved smoothly into an evening of music featuring talented local performers and popular Australian band Mental As Anything. Nosh features included the inaugural Australian Regional Homebrew Championships which drew 55 entries from eastern Australia and the first, tightly contested, Great Australian Cheesecake Competition. Pictured: The Nosh Cook Off was contested by five talented teams but the eventual winners were teachers Ellen John, Narrabri Public School, and Georgie Stoltenberg, St Francis Xavier’s. Above, MC Shanna Whan, judges Wanda Dunnet and David Pierce, Nosh vice president Kate Logan and president Darrell Tiemens, winners Ellen John and Georgie Stoltenberg and judge Annie Alexander. Nosh on Saturday - family day of food and music on the riverside parkland. The region’s premier food and wine showcase, Nosh Narrabri on Saturday will feature a record forty stalls serving and selling a delicious variety of foods and wine. The gates open at 12 noon with free admission to the Nosh. There will be a full bar service during the day and evening with a great music program starting at 6.30 as well as entertainment throughout the afternoon. Entry to the evening concert is $45. Concert goers are invited to bring a chair or blanket, sit back and enjoy the show. The Nosh Cook Off at 1pm will pit top teams against each other. At 2.15 share the excitement, and sample the brews, of the inaugural Australian Regional Home Brew Championships. There are 50 entries from leading home brewers from across eastern Australia. At 3.15 judges will announce the winner of the Great Australian Cheesecake Competition. Talented young Layten Smith will open the evening music program with popular local groups Three Legged Pigdogs and Hand of Hearts performing ahead of iconic Australian band Mental As Anything. Concert tickets can be bought on the day. Planning, organising, gaining authorisations and putting in long hours will culminate in a successful Nosh Narrabri on Saturday. Above, committee workers back, from left, Georgie Stoltenberg, Ruth Redfern, Helen Carroll, vice president Kate Logan, secretary Lindy McMicking and treasurer Amy Withington, front president Darrell Tiemens and Chris Jollow. Nosh Narrabri is certainly getting lots of runs on the board before the August event, and now it has done it again. Hot on the heels of the Australian Regional Home Brewing Championships and the announcement that legendary rockers Mental as Anything will be performing during the event, Nosh has taken things to another level for those with a sweet tooth. It will host Australia’s Greatest Cheesecake Competition (also known as the Nosh Cheese Cake Competition), which co-ordinator Jocellin Jansson reckons might be just the second such competition in the world. “The only other one we found was at the North Carolina [State] Fair,” she said. Ms Jansson and Brooke Dalton are the competition co-ordinators, with Penny Jobling the steward. And they are excited about the competition’s potential. “We’ve already had strong interest and inquiries,” Ms Jansson said. Only home made cheesecakes by amateur cooks may be entered in two categories (baked and unbaked), and upwards of 40 entries are expected. The winners of both categories will face off to determine the ultimate winner, and its maker will receive return flights for two to Brisbane, courtesy of Fly Corporate. They will be put to the test by seven esteemed judges - local cake decorating expert Janice Smith, Maverick Cafe proprietor Rhys Gard, Fly Corporate sales manager Geoff Woodham (a former chef), Stan Waldren, Glen Toogood (who is making a special return from South Australia), Katrina White of Relish, and sponsor Carla Baxter of Carla Baxter Real Estate. And to impress the panel, these cheesecakes will have to be pretty good. The first round of judging will be based on visual appeal and the top five cheesecakes from both categories will go through to the final. There they will be judged on taste, texture and visual appeal. But it won’t only be the judges enjoying the finest cheesecakes Narrabri, and possibly Australia, has to offer. “The whole community gets to be part of the inaugural competition,” Ms Jansson said. All proceeds will go to Nosh’s chosen charities. Registration is through the Nosh website, which also contains the rules and regulations for the competition. Cheesecakes will have to be delivered to the Narrabri Visitor Information Centre between 10am and 4pm on Friday, August 25, the day before the event. Entries, which are free, will be anonymous for judging, and more than one cheesecake can be entered. “It’s unique, it’s fun and it’s going to be a real highlight,” Ms Jansson said. “There’s nothing like it around and I think the funds raised from it will be a great addition to Nosh’s charitable contribution to the community. Mr Woodham agreed and said it was part of the “ongoing commitment of Fly Corporate to enhance accessibility to and from Narrabri is an important for Narrabri and the surrounding communities”. “Supporting such a wonderful and event secures our commitment to Narrabri and towns within close proximity and beyond which benefit from this service,” he said. Nosh Narrabri’s long-awaited return in August is expected to further cement the event as the leading regional food and wine showcase. The Nosh was in recess last year but on Saturday, August 26, locals and visitors will be welcomed to an exciting and innovative program of traditional and new features. The Nosh Narrabri committee has already announced that iconic Australianband Mental As Anything will perform on the evening of the event supported by talented local bands. Three months out from the Nosh more food and produce exhibitors have already booked space than the total in 2015. Now, Nosh Narrabri has announced that the Nosh will see the biggest ever home brew contest with the hosting of the Australian Regional Home Brew Championships. A winner-take-all first prize of more than $3000 will be offered to the top beer and its brewer. Home brewing is a popular hobby across Australia with many thousands of dedicated brewers. “We anticipate this will grow into the biggest home brew competition outside Sydney,” predicted Nosh Narrabri committee president Darrell Tiemens. The local, regional and state-wide home brewing fraternity is huge and entries are expected from far and wide for the Australian Regional Home Brew Championships at the Nosh. “Home brewers can be part of the competition by entering just one beer - Pale Ale, IPA, Porter or Pilsner,” said co-ordinator for the event, veteran home brewer Rohan Boehm. “We have four eminent and experienced judges who will choose the champion brewer and the champion beer. Mr Boehm has been a passionate home brewer since the mid 1970s. “There are many thousands of great home brewers out there and we anticipate they will be keen to be part of this major competition,” he said. Mr Tiemens said the aim of the home brew competition was to further develop the contest as a major feature of Nosh Narrabri, but also to help cultivate local creativity and talent. Mr Boehm will have a range of examples of his own home brews available for tasting at Nosh Narrabri with brewing equipment on display and will be keen to talk to interested brewers and potential brewers. Meanwhile, Nosh Narrabri was developing as a bigger and better than ever event, according to the organisers. “There is a fantastic range of foods and produce,” said Mr Tiemens. Tickets for the Mental As Anything concert on the evening of Nosh Narrabri were selling fast. “We plan to limit the number of tickets to maintain an intimate concert atmosphere,” said Mr Tiemens. Nosh Narrabri has announced today that they have signed up Mental as Anything to play at the “Nosh On” event on the night of Saturday 26th August 2017 between the Crossing Theatre and the Narrabri Creek. With nearly 40 years of recording and non stop touring plus 25 top 40 hits in Australia, Mental As Anything are coming to Narrabri as a special event (not part of their regular touring schedule). Nosh On is expected to attract a big crowd. Two local Narrabri acts will open for Mental As Anything starting at around 6.30 pm. The food and alcohol will be onsale during the event. There will be fireworks before Mental As Anything perform. Patrons will be encouraged to rug up as it will be the very last Saturday of winter and could be chilly. Tickets will go on sale at 12 noon Monday 29 May 2017 and will be limited to around 600 tickets. In addition 100 “Hundred Club” tickets will go on sale for people wanting to hang-out with the band and VIPs before the event and support the broader work of Nosh Narrabri. Tickets are expected to sell quickly and can be purchased by visiting our website (noshnarrabri.com.au). For more information. Please visit our website (noshnarrabri.com.au) or our Facebook page (facebook.com/noshnarrabri) or contact the Narrabri Shire Visitor Information Centre on 6799 6762. About us. Nosh Narrabri is a not-for-profit community-based organisation committed to promoting local, sustainable food/ beverage production in the northwest region of NSW. We are aim to make our events affordable and approachable to all people in the region. This year will be the 14th year that Nosh has operated in the region. About the event. Nosh Narrabri consists of three main events: The Food and Wine Expo (12 noon to 5 pm on Saturday 26th August 2017), Nosh On (6.30 pm to 10 pm on Saturday 26th August 2017) and the Long Lunch - a five-course French provincial lunch for 300 people held 12 noon to 5 pm on Sunday 27th August 2017.